The easiest way for me to up the ante with any outfit that I put together is with a statement necklace. And I must admit – lately, my necklace game has been on point! Stocking up on sparkling stunners in both gold and silver, I love having different styles of jewelry so I can play up outfits or push them over the edge with a simple statement piece. And since I’m on the budget side of things, that always helps. outfit is kind of “blah”, wearing jewelry changes the look instantly. since I obsess over her stunning assortment of jewelry! Case in point, you might have spied the Shiny Mix’s Dynasty Bib – a mixture of uber sparkle in edgy shapes – on my Instagram. 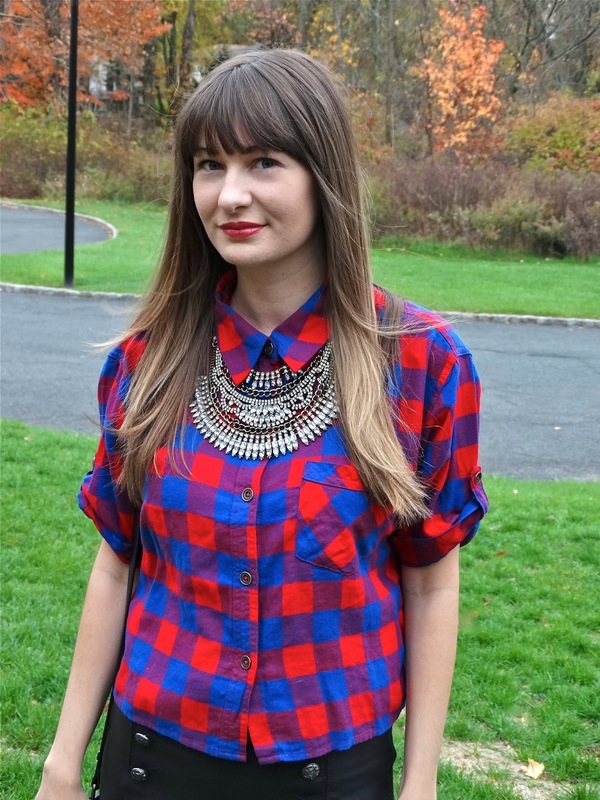 I paired it with a collared plaid shirt to give my two-tone top some sparkling contrast. It’s gorgeous. It’s serious. And it’s completely swoonworthy! Absolutely check out her site as you would be crazy not to find something that fits into your style aesthetic… and within your budget. She’s on Instagram, too, so you can envy all the shiny things she’s up to!